In front of this new CD / Blu-ray from the Jacksonville gang, we would be tempted to play the scandalmonger by claiming that theband masters to perfection the art of making something new with old. But it is necessary to qualify these remarks. Indeed, this show is about a dozen years old but was available only by the hazardous route of pirate recordings. So, do not be choosy and enjoy a slightly improved image that allows you to see the late Billy Powell and Ean Evans. We can also appreciate the great shape of Rickey Medlocke and the abilities of young Mark Matejka at the time. Provided, of course, to be equipped with a Blu-ray player. One can indeed wonder about this choice of support, a classic DVD having been more judicious and especially more sympathetic for the majority of the fans. No doubt a commercial choice of the distributor. Well, even in audio and despite an average sound, the concert is not uninteresting because the Florida combo shares the scene with some guests (surprising for some). The band starts with a classic "Workin 'for MCA" followed by "Red White and Blue" that Johnny Van Zant dedicates to American troops scattered around the world. Then comes "Gimme three steps" wrapped in a section of winds. Just after, the first guest arrives. This is Bo Bice (a winner of the show American Idol having put forward his admiration for Lynyrd Skynyrd) who shows up with his guitarist. He launches into a pop / rock ballad for teenage fashion victims ("The real thing") and it's rather funny to hear the hairy Jacksonville as a support band in a so conventional musical style. Bo Bice remains on stage to participate in "Gimme back my bullets". But the most interesting is yet to come with the arrival of a legend of country music. Mister Hank Williams Junior himself, the country man who often tinged his music of "Southern Rock". He jams on "Down South Jukin" (enhanced by a good slide solo by Mark Matejka) and performs with his Lynyrd Skynyrd old buddies one of his own songs ("Born to boogie" with a beautiful piano solo from Billy Powell). It's a real pleasure to hear and see all these Southern musicians in a beautiful ensemble. 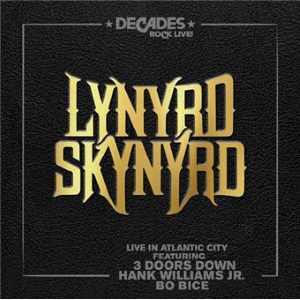 Then we go to the band 3 Doors Down which jams on "That smell" (sounding a little strange because of the addition of a section of winds) and plays one of his titles ("Kryptonite") with the guys from Lynyrd Skynyrd. Johnny Van Zant laughs while sharing the vocals and Rickey Medlocke seems very comfortable with this kind of music. However, Gary Rossington remains perplexed and wonders what he is doing there. The musicians of 3 Doors Down also offer a rather heavy version of "Saturday night special" that they perform alone like big boys. With the end of the show fast approaching, all guests are invited back for "Call me the breeze" and "Sweet home Alabama" (which starts with some arpeggios by Rickey Medlocke). There are more guitarists than the NAMM (the prestigious Chicago Music Fair) and the scene looks like a happy mess with the three winds and the two choristers. We finish in the tradition with "Free bird". Johnny Van Zant shakes hands with a little girl before Rickey Medlocke's final madness and imperial solo. What to say in conclusion? If we have to make do with the CD listening, this concert is really only worth the performance of Hank Williams Junior. If you have a blu-ray player (which is far from the case for everyone), you can enjoy a rather original moment in the career of Lynyrd Skynyrd. So let's hope that this show will be released on DVD for the happiness of the majority of the fans of the band. Otherwise, it will be necessary to be resourceful and to obtain pirate DVD "Lynyrd Skynyrd Freebird 's Dusty Boot" which contains many other things (including the first appearance of the survivors of the crash to Charlie Daniels Volunteer Jam in 1979).